Send out your light and your truth; let them guide me. Let them lead me to your holy mountain, to the place where you live. Today was one of those days when loneliness crept into my spirit. It is a nasty little bug that begins to bug you. You see couples everywhere and families doing family things and here you are, alone. No husband to hang out with while the kids are all grown and doing their own thing. I am I this position because of my own choices, however, sometimes it just get s to me. As I attempted to make plans for my first day of vacation, I came up empty and soon I would see that it was for a purpose. A purpose God had set up for me already. A deep calling to deep. A moment in today that God wanted to spend just with me and even though I was close to tears at some points, God was calling to His quiet place. So, I set out on a journey at the edge of the woods. Fourteen minutes into the adventure my body was asking all sorts of questions. What are we doing? I am not stepping another foot. It’s too hot. 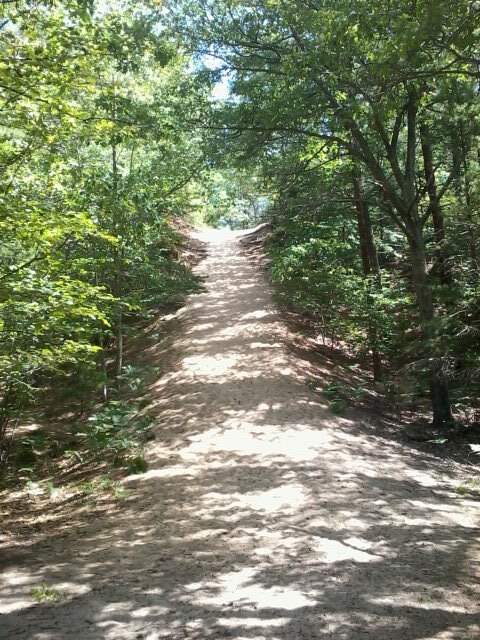 Did you see the steepness of the dunes? But another voice was whispering in my ear to come deeper and my spirit man was already way ahead of my flesh; so I pressed into God. I began to cry out questions to what may have seemed to anyone else empty air, but I was talking to my Daddy. Why are you calling me Lord? What do you want to show me today? Is there a lesson in all of this? Yes, He answered me, be still, be quiet and wait on Me. As I stood I silence and in surrender I heard a small noise just ahead of me. I lifted my head and what appeared in front of me was a fawn. One little fawn. We were both startled in the moment and as I tried to contain my excitement, she ran back to momma and her brother. What joy as I fumbled to get my phone out to take a picture. I was able to take 2 pictures and they ran off up the dune. 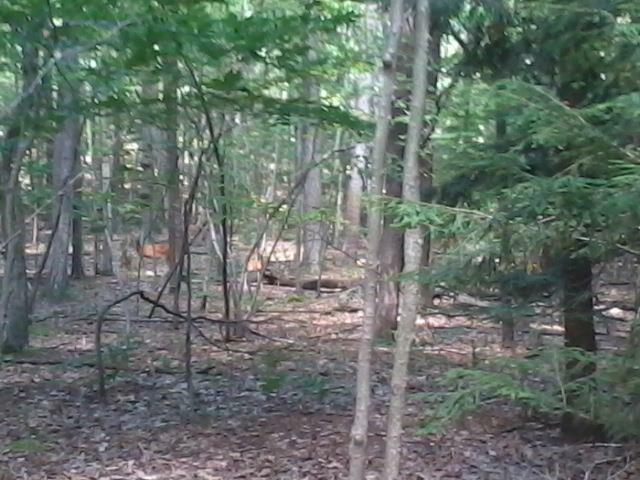 I stalked them for a few minutes and then I saw what I was lured into the woods to see, the daddy deer appeared, protecting his family. It was such an awesome sight and in that instant, I saw loneliness dissipate and be replaced with a promise of restoration. How often does one get to stand 30 feet from an entire family of deer? I was so filled with joy I could hardly contain it. As the family ran off into the woods, I knew I would not find them again, yet I felt God was not finished with me yet; so I traveled farther. 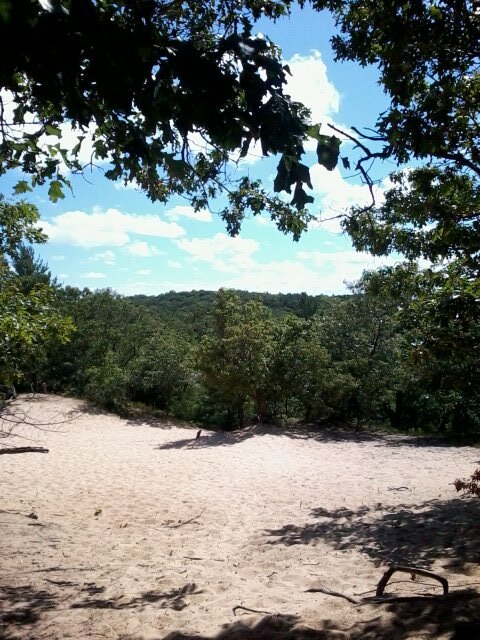 As I climbed dunes and tripped over roots, I listened for God’s voice. Finally as I reached a ridge like area, God had me turn and take in the view. To my right were treetops and a beautiful landscape of blue sky and just perfectness. 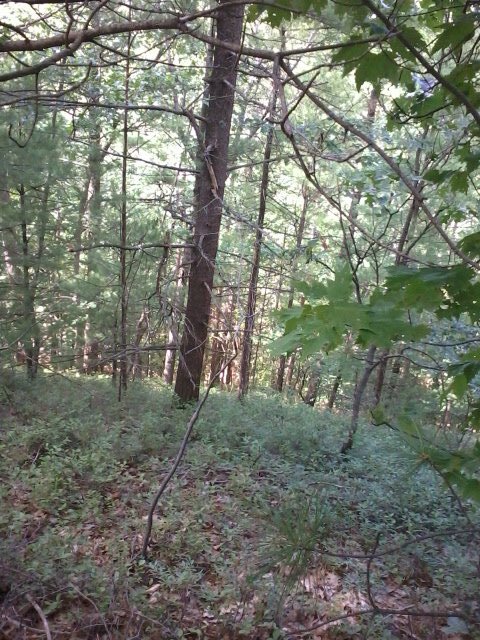 On my left was a ravine. He spoke this to me as I stood there in perfect peace: I have raised you, shown you the Light. You have climbed the mountains and now you reside with Me in a place of peace. From this moment on you will walk along the ridge, not fearing the drop below you, but eyes focused on Me. No longer will you feel lonely for you are more near Me than ever. I will keep you from falling again if you just focus on Me and seek My joy that I have for you. And now I know why everyone in my life was busy today…God wanted me all to Himself for just a little while, and I am so happy that He did!